Enjoy a true slice of Americana as you celebrate Independence Day on Madeline Island. This annual Fourth of July celebration is a tradition on Madeline Island. 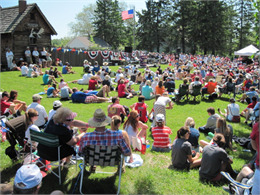 Island residents and visitors gather on the Madeline Island Museum Green and take part in the day's festivities including a parade, speeches, music, and fireworks.